ISS ProRack has a range of general storage and pallet rack accessories that can be purchased alone or in combination with our storage solutions. This includes heavy-duty pallet racking protection products, such as column protectors and guards, to save your warehouse from the costs and downtime associated with accidental damage. All of our industrial storage systems are of the highest quality, with ISO9001 certification. As with every quality product, however, there are still things you can do to get the very best performance out of your system. That’s where ISS ProRack can help. To assist you with achieving maximum productivity and the safety of your people, your storage equipment and the products that you store, ISS ProRack offers a variety of products. 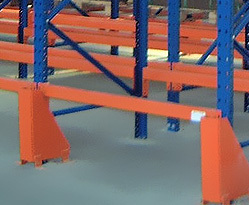 When you choose storage accessories and pallet racking protectors from ISS ProRack you can be sure of durability and strength. Our accessories have been carefully designed with safety, longevity and functionality in mind. For quality you can trust, choose ISS ProRack: the storage solution specialists. For more information on any of our pallet rack protection products or other accessories, please don’t hesitate to contact us. "The retail world demands prompt and informed service, which is precisely what ISS ProRack delivered to our company when we needed help." Welcome to a better alternative in smart storage. Please contact us for all Commercial and Industrial storage needs.